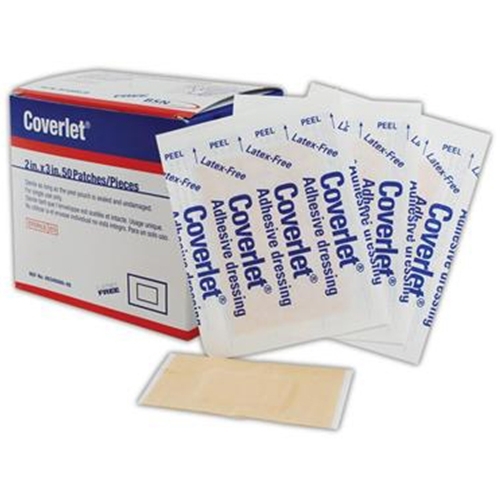 Coverlet Adhesive Bandages from HealthyKin.com feature an extra large wound pad capable of absorbing 10 times its own weight in water. The 360 degree adhesive surrounding the island pad helps seal the afflicted area from dirt and contamination. Best bandage on the market. Dependable, and durable adhesive, which keeps the bandage on the skin until YOU want it to come off. And when it comes off it does not tear your skin in delicate areas; e.g., back of hand. This adhesive, combined with a thin, flexible backing, which is slightly strechable, makes these bandages the absolute best available. These are the best. I tried other products and they do not even come close. The price is amazing. These are the BEST! I love the oval shape; so much better than a spot. They stay on and cover better and being latex free, I never get a rash. I wish they were available locally. 1"x3" band aids are great. Good adhesive. Fantastic protection. Great band aids and cheaper then I can get even at Wal-Mart. They stay on a long time, and do not leak. My dad used these for years as an athletic trainer. They are by far the best out there and I will continue to use them even if I have to order them.